By now it’s no secret that I don’t enjoy cooking. I’m learning but the enjoyment hasn’t kicked in. Some of our family traditions happen in the kitchen and this means I need to try for the sake of keeping the tradition alive. This Thanksgiving recipe stems from my grandmother and ever since I can remember my mom has been making this recipe each year. It is a delicious alternative to bread stuffing and it is gluten free – just make sure you check the labels of your ingredients to make sure they are gluten free. I love bread stuffing but this meat stuffing is addicting and why we only make this dish during Thanksgiving boggles me because it is a satisfying dish for any day. This isn’t a secret family recipe because when I asked my mom for the recipe for the blog – she coughed it up pretty quickly. I guess the idea of her Brickellista becoming a domestic goddess is reason enough for her. So off to the kitchen I go to share the recipe with all of you because you all are like my family. And since I can’t be at all of your tables this year (feel free to overnight leftovers) hopefully this recipe will make it to your table in my place. 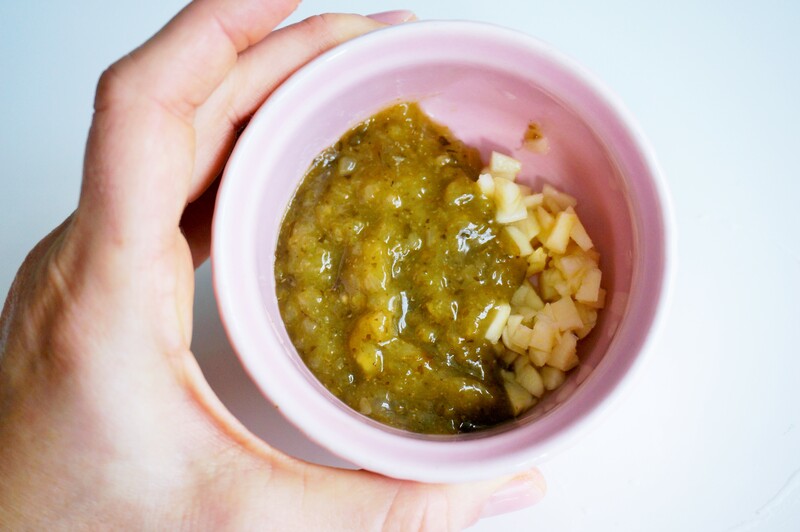 3 tablespoons of Recaito Goya (cilantro) – this is NOT gluten free but I happen to like the taste – make sure you find an alternative if you are sensitive. *Make sure that you remove the casing from the sausage or you can get the sausage without the casing at your grocery store. 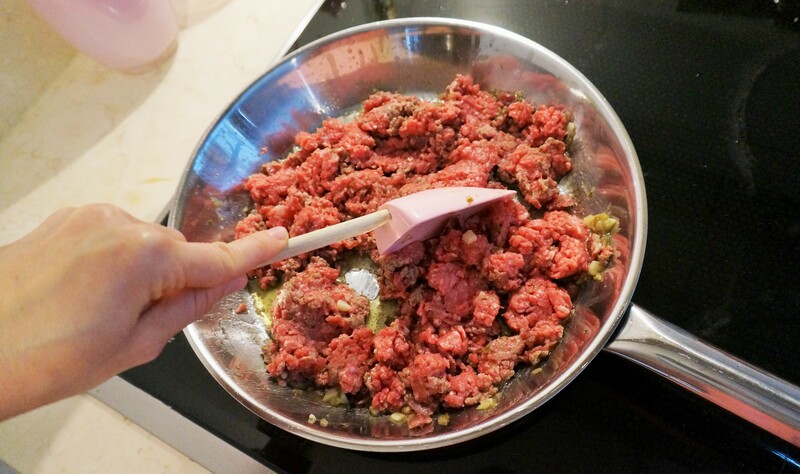 In a big bowl, mix together the ground beef and the mild Italian sausage. Using your hands – gently combine until blended. Set Aside. Cover the bottom of a deep pan with olive oil and place over medium-high heat. Add the recaito, and the garlic to the oil and heat for a few minutes. Add to the pot the mixture of the ground meat and the sausage. Keep mixing, turning and browning the mixture, making sure that you cook the meat as much as possible without burning (just loose meat, no chunks). 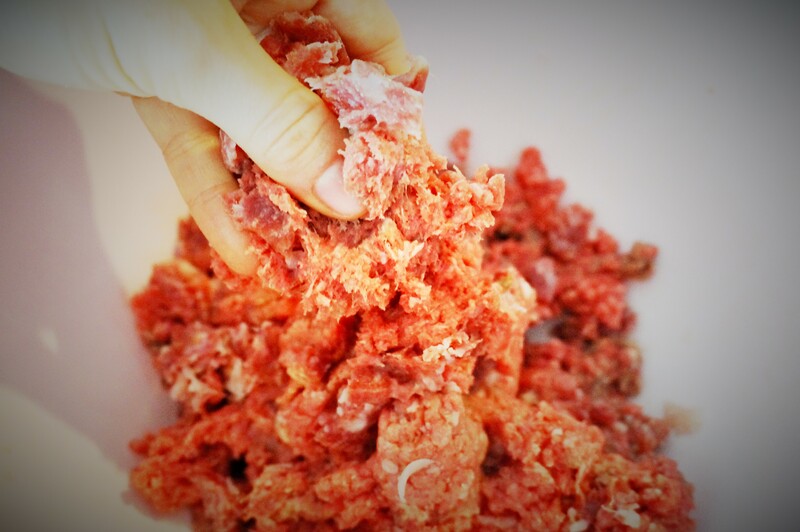 Once the meat looks cooked, you can season with the salt and the black pepper. Then, add the rest of the ingredients to the mixture, except the raisins. Add 1/2 cup of the beef broth, cover the pot and cook for 5 minutes on med-low heat. 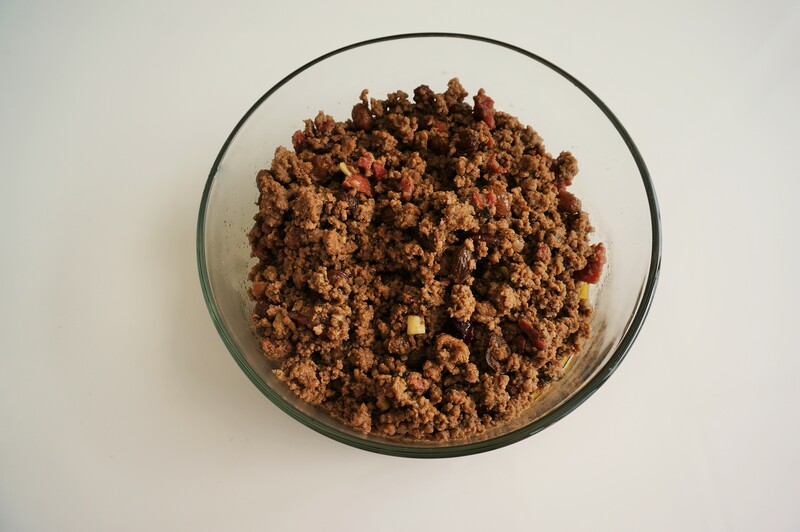 Add the raisins, mix well with the meat, cover and continue cooking for 25 minutes on med-low heat, mixing at least once during that period to make sure that the meat doesn’t get too dry. Use the rest of the beef broth if necessary. You can decide to serve this as a side dish or you can use it to stuff the turkey, as my mother used to do. If you will use it as stuffing, make sure that the meat is completely cold before stuffing the turkey (preferably refrigerate 3-4 hours before stuffing). I think it looks perfect as a side dish. For my adaptation I added dried cranberries along with the raisins… after all… it is Thanksgiving! Hope you will enjoy this dish as much as I do. Happy Thanksgiving to all of you, my dear readers. This year – I am grateful for all of you because you inspire me everyday to continue doing what I love. Meat stuffing!? With recaito?! My family made White Castle stuffing with sliders (bun and all), aaaannd THAT’S the Midwest for you. I adore this.